Mobile ad campaigns run with Gay Ad Network can target specific devices, locations, mobile websites and mobile apps to maximize campaign efficiency. Most of the popular gay apps, including Grindr, Scruff, Growlr, Jack'd and Romeo support in-app banners and some offer full-screen interstitials as well. By leveraging our proprietary first-party LGBT audience profile database, advertisers can target LGBT consumers outside of gay apps. Campaigns may be delivered to gay consumers on mainstream apps and mobile websites across the major ad mobile exchanges and mobile ad networks. Whitelists and blacklists may be created to control inventory placements. Campaigns can be targeted to the leading gay apps, reaching millions of mobile gay men. Full-screen interstitial ads maximize awareness and engagement. This capability is available on select apps. Full-screen takeovers, text messages and in-box messages can be broadcast to mobile users. We can deliver ads to LGBT consumers on non-gay apps to maximize campaign reach. 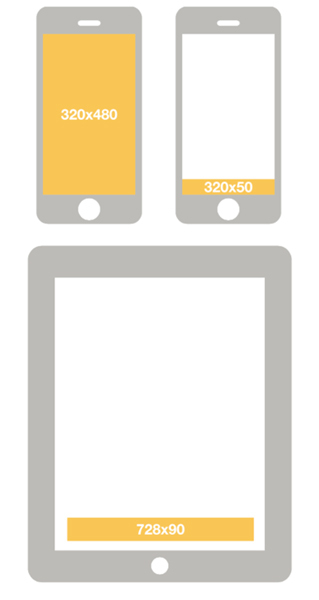 The most popular in-app mobile banner ad size is 320x50. In addition, 728x90 banners run on tablets. The full screen mobile interstitial is 320x480 pixels. Broadcast messages appear when a user logs into the app. In-box messages are pushed to a user's in-box and can be viewed at any time.